Instead of a regular ol' Valentine card, I decided to do something a little different for my best girlfriend - who by the way is super girly, and create a framed rose Valentine with vintage chic pink rose gift bag. While I was out shopping the other day I popped into Michaels and found they have started putting out some really girly stuff for spring in their dollar section. I picked out a shabby chic little chippy white frame, a packet of pink paper roses and a pack of tiny floral note cards. First step in this easy little craft is to cut a piece of one of the note card to fit into your frame, now glue your little paper roses into a heart shape onto the paper you've cut out. (Each little rose has a sticky backing, but they aren't sticky enough to stay so I glued mine with Elmer's.) Now insert into your frame. I decided to create a little muslin bag for my little framed rose Valentine. As usual I found the perfect vintage pink rose Valentine image over at Graphics Fairy and added the word Valentine and printed out on a iron on transfer paper. Because there is wording on the image you will need to print this out as a mirror image, so if your photo or graphics program is unable to flip the image you can do this in a couple of easy steps at Picnik. Very pretty and creative idea! I'm sure your best friend will love it. I know, Michael's had the prettiest shabby chic stuff the other day. I bought a lot..... more than I mentioned in the post, but don't tell the hubby! So pretty. Don't you love that shabby chic line at Michaels? I just bought some decorative clothespins in that same pattern from the dollar section. 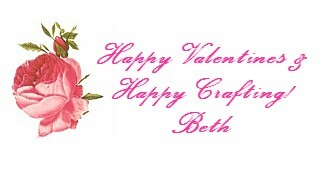 Your blog looks really neat...glad I found you via Creative Me! This is a great idea and GREAT for young girls to old women like myself. Thanks for sharing this idea. Girl I luv your blog and your jewelry.....Thanks again. Oh I love that...so pretty! Thanks for linking up at Giggles, Glitz & Glam. So soft and feminine and very, very pretty! Love it! So dainty and pretty. what a pretty frame! Love your flowers!! I am stopping by from the Yesterday on Tuesday link party where I've linked up too. Featuring you adorable Framed Valentine at Project Queens #2 V-Day Highlight Party tonight! Thank you so much for linking up. Hope you come back again this week. Really cute idea! Thank you for joining me at Home Sweet Home!